Harajuku shop staff wearing white t-shirt, striped button down skirt over remake denim pants, platform white sneakers, tote bag, white cap and a watch. Harajuku girl in colorful street style with pajama top, striped skirt with tasseled hem, fuzzy shoes and kawaii accessories. Harajuku fashion college student in striped fashion with blazer over collar shirt, striped skirt, striped socks, sneakers and accessories. Harajuku girl in jeans, tower print shirt, sneakers and backpack vs. Harajuku girl in t-shirt and midi skirt, with backpack and platform loafers. 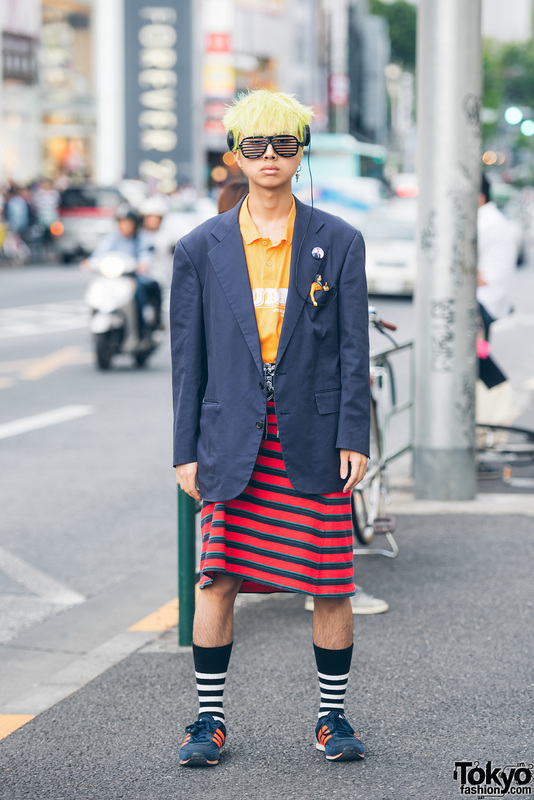 Japanese fashion producer on the street in Harajuku wearing a wide brim hat, a blue blazer, Swankiss items, and a Chanel cloth bucket bag. Harajuku creator with braided tails, wearing a denim jacket, striped skirt, tote bag, headscarf and sneakers. Harajuku girl with blonde hair, colored contacts and fangs, wearing a striped two piece over a shirt, neck bow, satchel and mary janes.